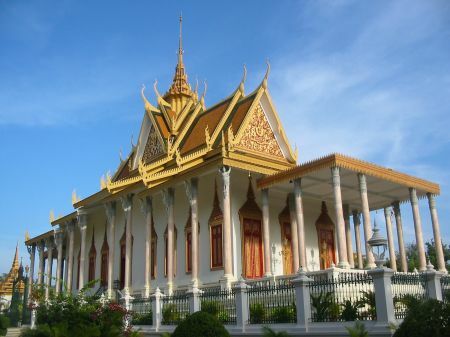 The plan for today is to visit Wat Hanchey (Han Chey) in the morning, attend my friend Ny’s wedding in the afternoon and ride back to Phnom Penh before it gets dark. Yesterday I agreed with the guesthouse guy that we would meet at 7:30am and that he would show me the way to Wat Hanchey. 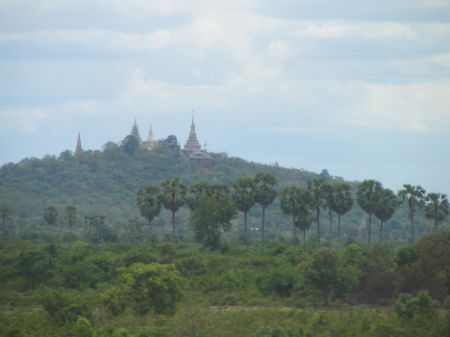 The guide books say that Wat Hanchey is a beautifully located hill top pagoda that was an important religious centre during the Chenla period. 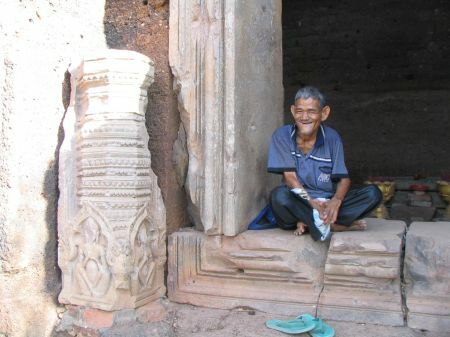 They also suggest it is easy to visit Wat Hanchey, which is about 25 km from Kampong Cham town, by boat. Anyway, I take the bike for convenience and time efficiency. 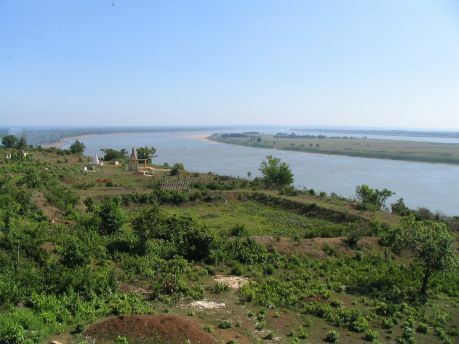 We start at the agreed time without any breakfast and head north along the Mekong. 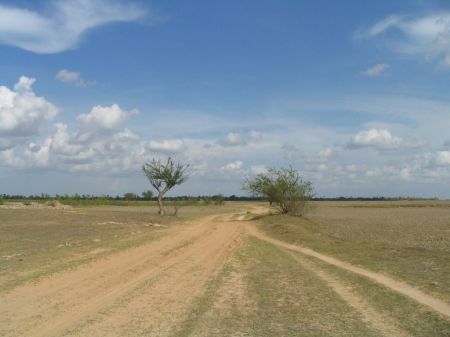 After very few kilometres we are riding on a narrow and bumpy dirt road. 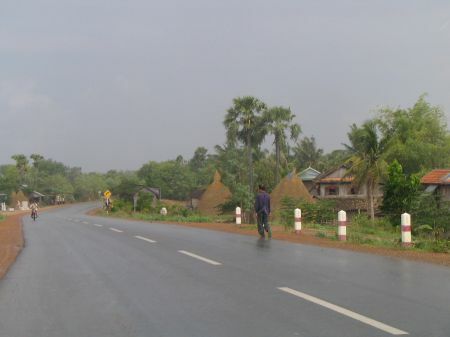 The road leads along the Mekong through a couple of villages in a nice and rural setting. We are not the only ones on the roads. There are all kinds of vehicles, like oxcarts, minibuses and bicycles. 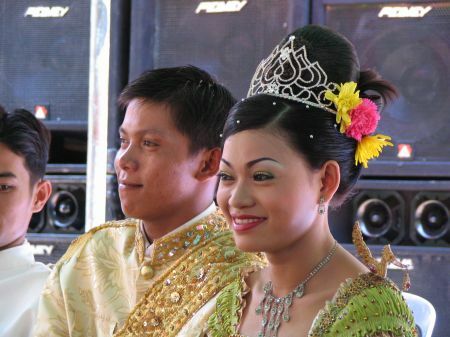 My friend Sok Ny gets married this weekend in Kampong Cham and invited me on the occasion of this event to join in the celebration. 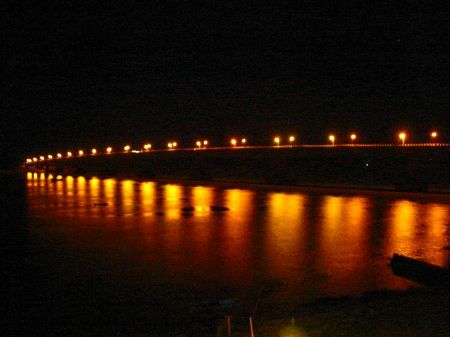 I decide to attend on Sunday and visit a number of places in around Kampong Cham town on Saturday evening and Sunday morning. 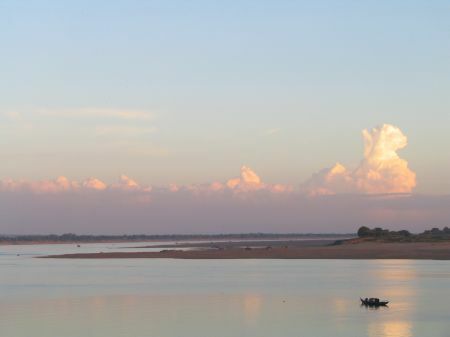 Today I just want to travel to Kampong Cham, which is about 129km from Phnom Penh, check in at some accommodation and visit Wat Nokor (Angkor Bahjay) before it is dark. It is weekend again and I am planning to visit Phnom Udong (Phnum Odongk) with two of my colleagues, Maraille and Lydia. I have been to Udong before and will avoid repeating what I wrote in the other article and rather provide some more pictures. We have an extensive and late breakfast in Phnom Penh before we leave. We arrange a car with a driver (a Toyota Camry with the steering wheel on the left hand) for $24 both ways. Then we start. 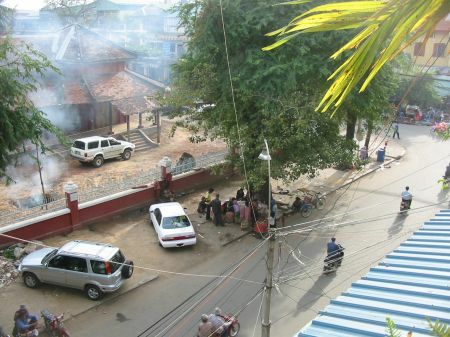 The road is quite busy at this time and there is a lot of traffic in the outskirts of Phnom Penh. It is getting better while we are coming closer to Udong. After the major part of my current assignment is done I decide to spend an extended holiday in Sihanoukville. 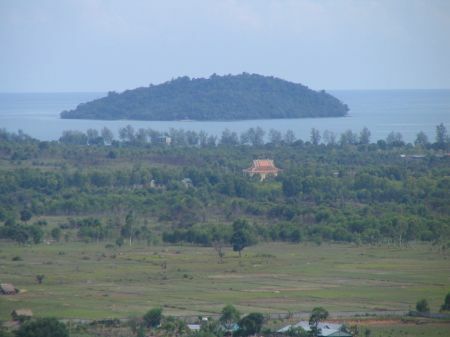 Sihanoukville (Sihanouk Ville, Kampong Som) is where the white beaches and tropical islands are. 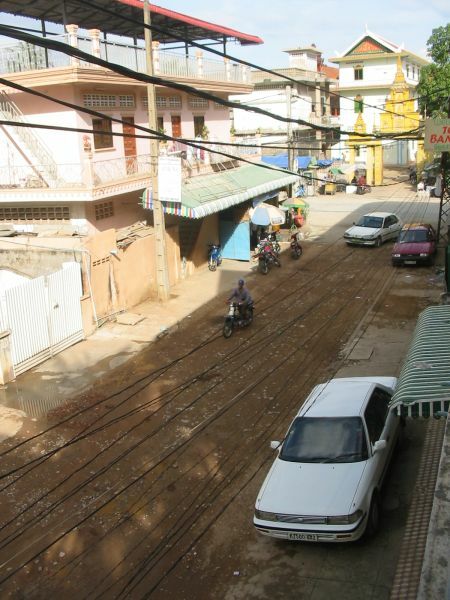 Sihanoukville is also one of the few places in Cambodia with a high concentration of tourists and this has been among the major reason why I have never been there. 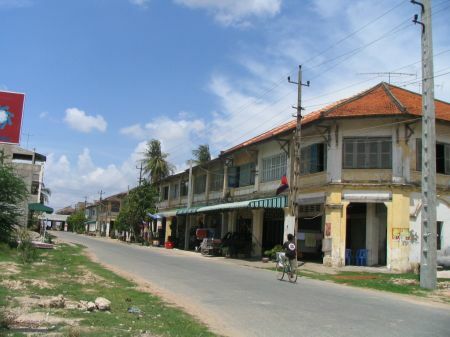 Sihanoukville is about 230km from Phnom Penh. My colleagues strongly advice me to go by bus. Yet I have been looking forward to do this trip by motor bike and decide not to take the bus. It may sound trivial, but during almost one year outside Cambodia, the idea of riding motorbikes in Cambodia became almost the essence of freedom to me. In practice I find it often tiring or boring, sometimes even painful, but in principle I still greatly enjoy riding the bike and opt for it whenever I can. I am also in the privileged situation of having Tobyâ€™s bike, so it is not a difficult choice. However, riding the bike gives me also a sense of vulnerability. 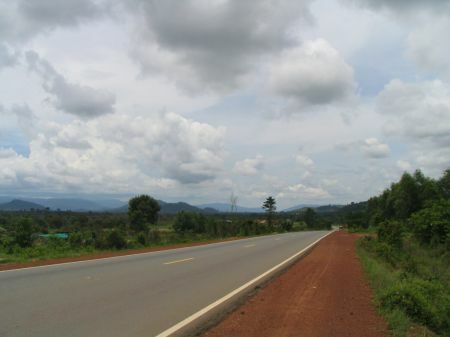 There are basically two options to ride to Sihanoukville: on national road 4, which is supposed to be the best road in the country, and on national road 3 through Kampot. 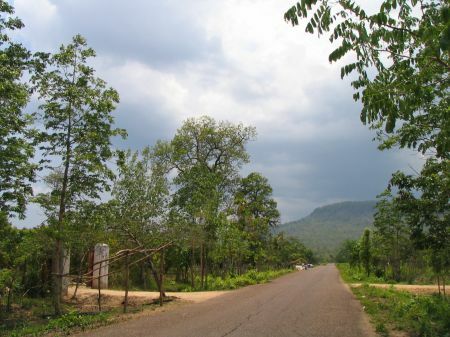 I choose the first option, as it is the most time efficient, and because I have been riding on national road 3 to Kampot before, but not on national road 4 beyond Kirirom National Park. Today is Sunday. I have recently moved and live now in the Apartment of Toby and Katrin, the second time that I have this privilege. In addition, Toby was kind enough to let me ride his motor bike. This has boosted my quality of live enormously and in particular my mobility. I greatly enjoy riding to work and all around in Phnom Penh. After I was unwell yesterday I want to make up today. The plan is to travel to Takeo (Takaev) Province. All three of my guide books recommend visiting Phnom Da (Phnum Dai), Angkor Borei and the â€“ partly ancient – ‘water canal highways’. The ‘Adventure Cambodia’ guide book in particular praises this trip and recommends visiting Angkor Borei by fast boat from Takeo town. 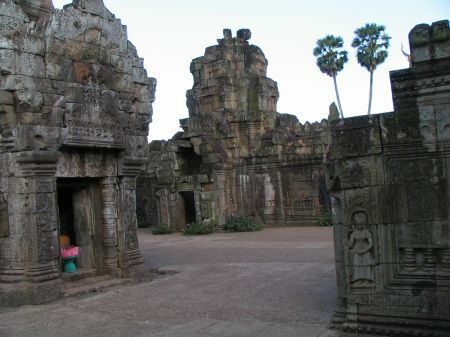 It also says that Angkor Borei town (which is connected by water to Takeo town) may have been the heart of the Funan empire, which is called the â€œCradle of Khmer Civilizationâ€� by Cambodians. The Funan empire is much older than Angkor and had its heyday between the 1st and 6th centuries and stretched across South Vietnam through Thailand, down through Malaysia and into Indonesia. This sounds all very interesting and I want to give it a try. Today is Sunday. I have spent a busy week in the office. 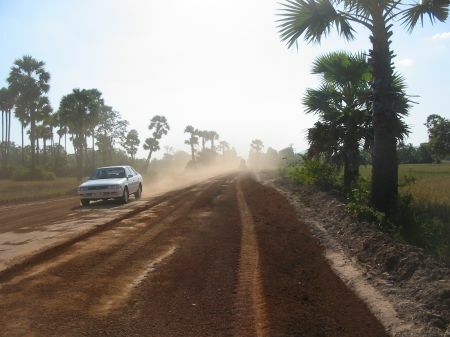 The schedule does not look like workload will be lower next week, so I use the chance for a bike trip to Kampong Speu (Kampong Spueu). Yesterday I took it easy, met some colleagues in private and some Cambodian friends in the evening. I go to find the Phnom Penh Bike Shop but find that it is no longer. I find the previous owner in his brother Darahâ€™s bike repair shop and talk to both for some time. Good to meet those guys again, after more than one year. The plan for today is to get a motorbike from Lucky Lucky and go on a trip to Kirirom National Park in Kampong Speu province. Oddly, none of my guide books has a section on Kampong Speu. Only the Lonely Planet has a paragraph on Kirirom. 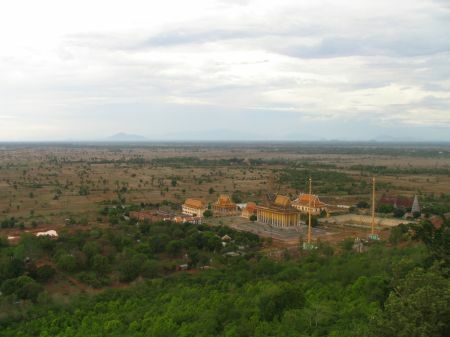 It says that Kirirom Mountain is 675m above sea level and about 112 km southwest of Phnom Penh. 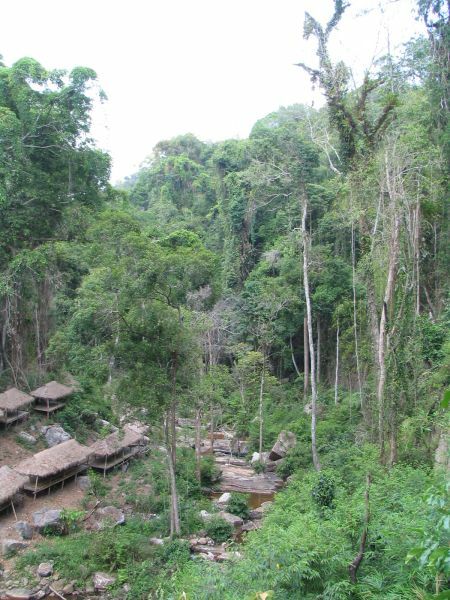 It also says that Kirirom â€œis not the most interesting of Cambodiaâ€™s national parks, but it is the most accessible from the capital and the scenery is notably different from the flat agricultural land that surrounds Phnom Penh, and the climate is also noticeably coolerâ€�. While this does not sound particularly promising, at least the â€˜noticeably coolerâ€™ appeals to me. 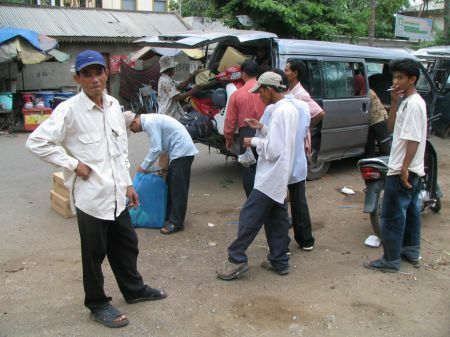 It is very hot in Phnom Penh these days, which makes working and sleeping a major problem in times. 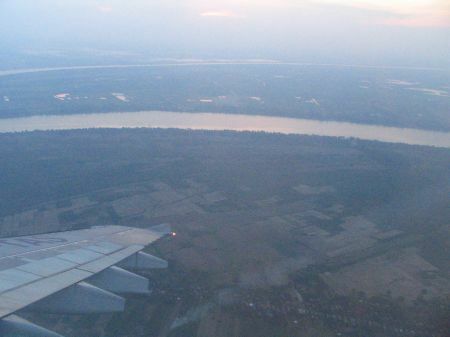 My flight from Bangkok to Phnom Penh is in the early evening of Sunday. 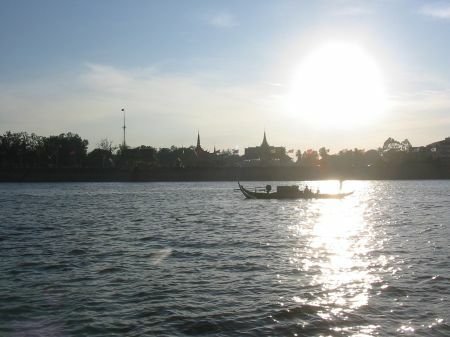 I proceed smoothly and I arrive in Phnom Penh in the evening. I spend the rest of the day along the river side, oberving the somewhat muted New Year celebrations. Some weeks ago Dara and Vuth had told me there would be a massive yew year party at the casino on top of Bokor Mountain in Kampot province. They told me they would go and asked whether I would join. I agreed and reserved a bike at Phnom Penh Bike Shop for December 29. I just gave back the (pretty used up) Honda Baja yesterday to lucky! lucky! Today I find at the Phnom Penh Shop that only one bike is left, which is a Honda Degree. 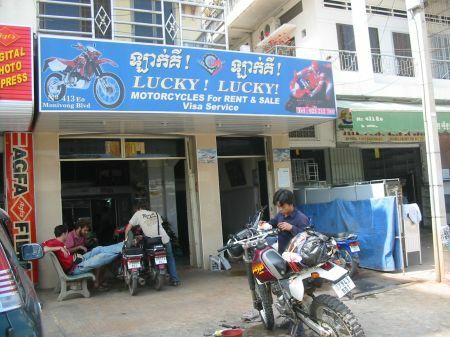 Those bikes are the most common, cheapest and in many cases oldest dirt bikes available in Phnom Penh. Yet at this point it is not likely that I get a better bike anywhere else and I take it. Furthermore I learn that Dara, Vuth and the owner of this shop have left already to hit Kirirom National Park on the way to Bokor. I have been to Kampot but never saw Bokor before. And I do not mind having a special New Year party. 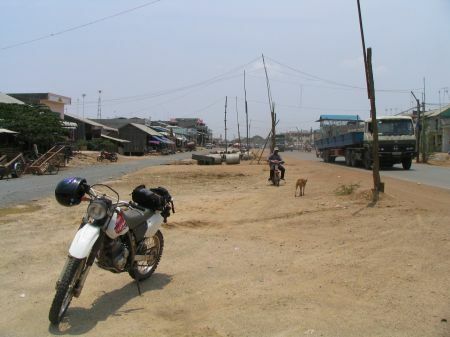 After I get the bike I decide to leave the next day, to go the 150 km to Kampot. This gives me more time to spend in Kampot and I assume there are fewer crazy people on the road heading to this party. 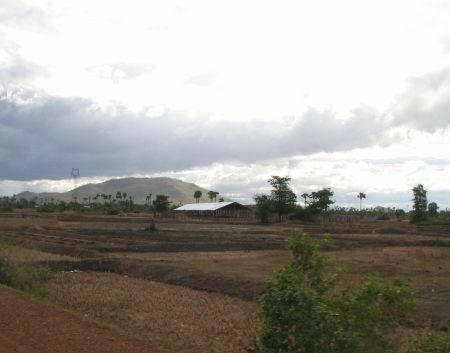 Kampot is a three hour trip from Phnom Penh, mostly on National Road 3. The plan is to go some time the next day the remaining way to the top of Bokor Mountain. The road up to the summit of the mountain is said to be difficult. I get up at 7:30 am. The plan is to have breakfast at riverside and buy some stuff in the market before heading to Preah Vihear. Today is Sunday. I had agreed with my colleague and friend Shelley to go on a trip into the countryside with her and her Cambodian partner Long. At about 9 am I go to the riverside and have breakfast. At 10 am I meet Shelley at her house. 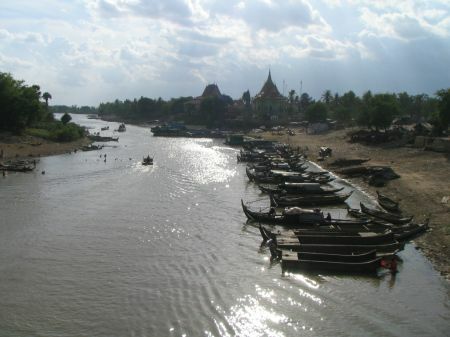 We spend some time and than kick of, crossing the river in the south of Phnom Penh, riding on two motos. 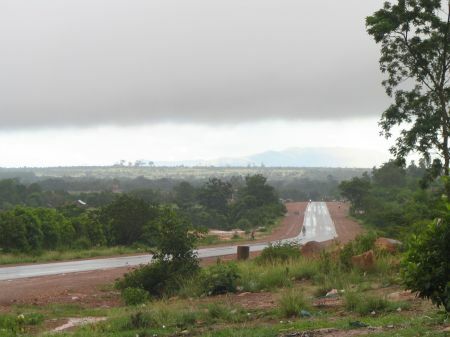 We are heading southeast on National Road 1. And we are not in a hurry. This is Saturday. I get up relatively late and ride to the riverside to have breakfast. Later I go to the Central Market, to buy some stuff, including clothes and a CF card reader for easier transfer of pictures from my camera to the computer. There is some sort of shopping center next to the Market, located in one of the highest and most modern buildings in town. I spend more than two hours here and actually take some nice pictures from the roof. However, due to malfunctions of the card reader I mentioned earlier I loose those pictures, which is a shame. Moreover, the card reader seems to have disabled two of my flashcards, which is particularly pitiful in the case of my only 256 MB card. I have fast food for lunch, which is actually the first time in Cambodia I eat burger. Later I go home and still later decide to visit the Royal Palace today. I read in my guidebook that entrance and camera fee is $5 and an official guide between $2 and $4. I reach at about 4 pm. After I pay five bucks I am told by the only available guide that the costs of his service are actually $5. He studies at Norton Universityâ€™s Faculty of Law. So I tell him I am a student myself and cannot afford so much money. It takes me some time to negotiate $4. I should have mentioned that I moved into another accommodation. 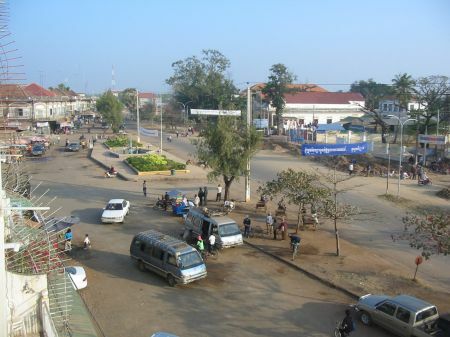 Even before I went to Mondulkiri I was talking to Katrin on the phone. 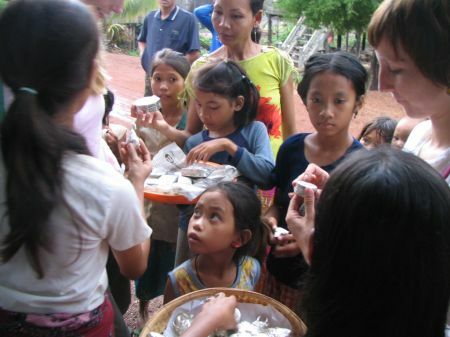 Katrin has been working in Cambodia and is in Germany by now. 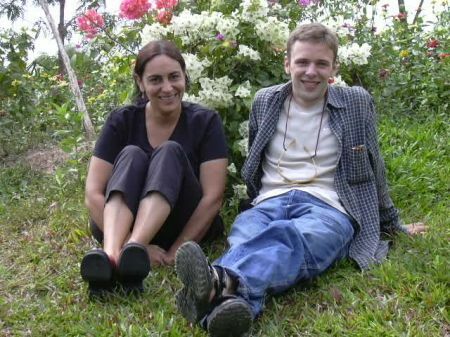 Katrinâ€™s partner is Toby from Canada who has been working in Cambodia for a number of years. He is currently in Germany, too. 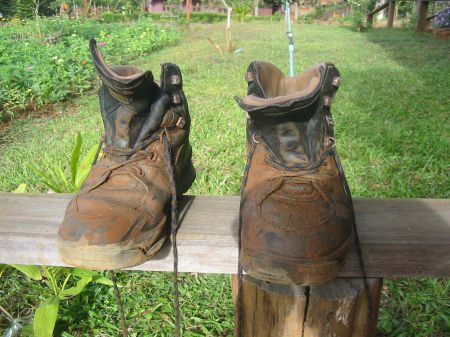 I had decided earlier this week that I would leave to Mondulkiri on Friday one way or the other. 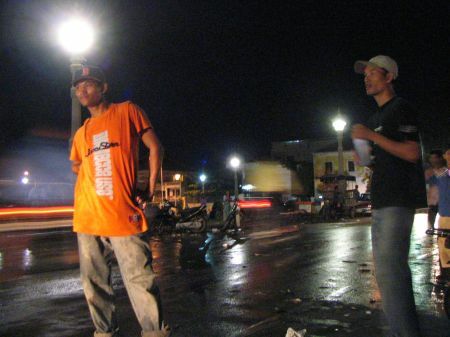 Yet as I wanted to avoid riding at night time in Mondulkiri I planned to go only the few kilometers to Kampong Cham provincial capital and continue the next day to Sen Monorom.